It turns out Bellevue‘s fate is as mysterious as the show itself. 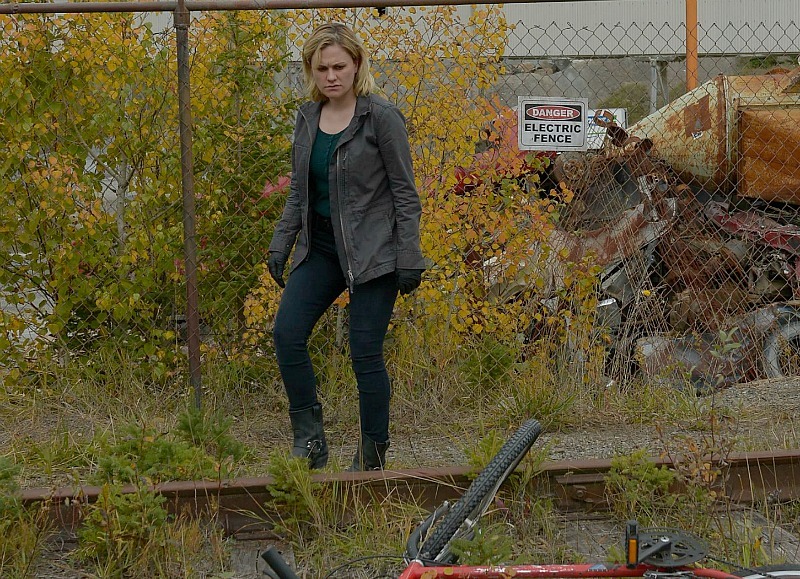 After reporting last Friday that a second season was being developed for CBC came a troubling update: there is no home for the Anna Paquin-Shawn Doyle led series after all. Fellow Bellevue co-creator Jane Maggs is going to be part of next month’s Writers Talking TV event—find details on how to attend that here—and we’re sure the topic of a new home for the program will come up. Produced by Mitchell and Janis Lundman’s Back Alley Film Productions Ltd. and Muse Entertainment Enterprises, Bellevue was co-created by Mitchell and Maggs with the latter serving as senior writer, executive producer and co-showrunner with Mitchell. Season 1 of Bellevue starred Anna Paquin as Annie Rider, a brilliant but troubled cop in the town of Bellevue whose past returned to haunt her following the death of a transgender teen. During the course of her investigation, old wounds were opened and secrets revealed, putting her at odds with her ex-husband, Eddie (Allen Leech), her superior, Police Chief Peter Welland (Shawn Doyle) and putting the relationship with her daughter, Daisy (Madison Ferguson) in jeopardy. Season 1 also starred Billy MacLellan, Sharon Taylor, Janine Theriault, Amber Goldfarb and Sadie O’Neil. Listen to Maggs discuss her career and the creation of Bellevue during our recent podcast and read Carolyn Potts’ reviews; here’s the link to her season finale review. Where do you think Bellevue should go if it doesn’t return to CBC? Comment below. Let’s get this out of the way right now. Bellevue isn’t a feel-good drama. You won’t walk away from it whistling and snapping your fingers. You may very well want to retreat to a corner, curl up and rock slightly. It’s CBC’s darkest drama, akin to fantastic shows from the UK and Netherlands like Hinterland, Shetland, Broadchurch, The Fall and Wallander. And that’s exactly why you should be tuning in. The eight-part Bellevue, debuting Monday at 9 p.m. on CBC, seems like it should be a traditional whodunit: Det. Annie Ryder (Anna Paquin) is called in to investigate when a teenager goes missing in her small town of Bellevue. 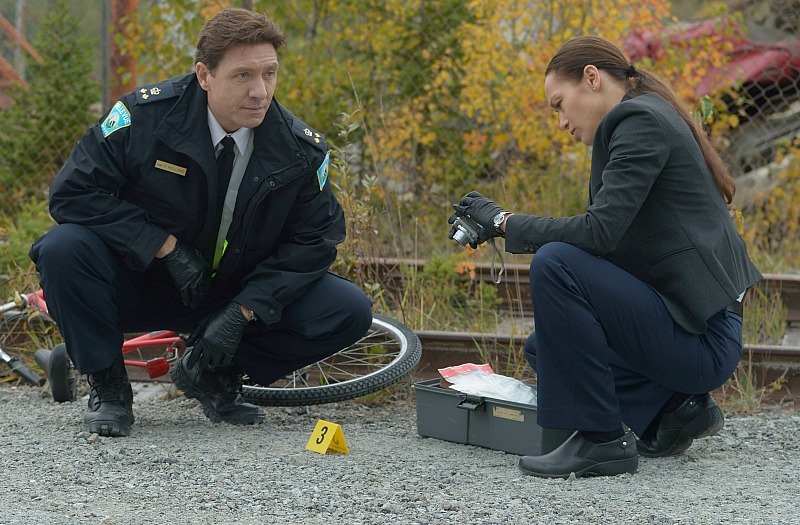 She and police chief Peter Welland (Shawn Doyle) dig for clues and uncover plenty of secrets. But the secret teen Jesse Sweetland (Sadie O’Neil) is keeping—that he wants to transition to female—is just the beginning. Annie’s past is fraught with tragedy. Her father killed himself when she was a girl and, soon after, she started receiving mysterious notes signed by him. Now her past is intersecting with the present because notes addressed to her are starting to show up again. Filmed partly in Thetford Mines, Que., the blackened hills—the area used to be an asbestos mine—night scenes and blue filter exude a sense of dread that crosses the line into the downright scary. Bellevue is a town struggling to survive and not everyone living there is nice. Jane, I understand Bellevue was a little different before you brought it to Adrienne. How was it different? Jane Maggs: It was a little smaller. There was still a mystery and a disappearance, Annie and her relationship with her family was a very strong part of the series, and a mysterious person from her past that comes back. That was the kernel of the story. What we did with Adrienne was make the world bigger and, in some ways, more relevant. We brought a lot more of the town into it and making it more complex. Adrienne Mitchell: Together we also probed what it would be like to have the character that was missing be the hockey hero and also struggling with gender identity. I read Jane’s initial pilot while I was on a flight and what Jane brought to it was that these characters were all there and had this authenticity and specificity that leapt off the page and felt real. I read a lot of scripts and don’t often see that kind of sophistication. Aside from the eerie moments and scariness, Bellevue asks some serious questions about sexual identity and religion. Jane Maggs: The questions around identity came about because we wanted to explore what it was like to be different in a small town. It’s not the same as being different in a big city. We explore that through Jesse and other people in the town, including Annie herself. As for religion, in Bellevue the church has a bit of an archaic form there. The people have their checklist of values they believe in and live by and those don’t alway line up with what it means to be a good person. How is Annie viewed by the townspeople? Is she seen as damaged goods after everything she’s been through? Jane Maggs: It depends on who you ask, but I think to the masses there is an element of damaged goods to her. Everybody knows her history and she grew up there and flailed in front of people. She was wild and made a lot of mistakes in front of people; they have their view of her and it goes back years. I think Peter, her superior, and Eddie [Allen Leech], her partner, have different views of her. What was it about the scripts that you read that attracted you to Bellevue? Anna Paquin: The scripts are very, very well-written. Jane is a wonderful writer. They’re complex, rich, smart and detailed and like most things, I was sent a script for the pilot. I read it and was like, ‘Well, what happens next! ?’ Literally, over the course of a few hours, I was emailing, asking for the next one and the next one. I got to Episode 4 and there were no more scripts left. Then I asked, ‘OK, when can I meet with these people? !’ [Laughs.] It’s not just that the plot kept me engaged, it’s a very rich and complicated character. She occupies a world that is seemingly a nice, small town. But, like any town, there are dark things that happen. She lives life on the edge and is passionate in a way that is reckless, but it all comes from a very good place. Shawn Doyle: I wasn’t that interested, to be honest. I’ve played a lot of cops, as you know. With cops, you have to go through all of the procedural stuff because it’s part of the story but it’s only engaging to an actor to a certain extent. But then I read the scripts and they were very good. I had faith in what they told me. The didn’t tell me exactly what was going to happen. And, in fact, once Anna and I started working together, based on our connection they started to extrapolate the storyline based on that and created back story and a way forward based on what they were seeing from us, which was exciting. My character grew very complex and presented an interesting challenge. What can you say about the relationship between Peter and Annie? Anna Paquin: Peter was a young cop and sort of mentored by Annie’s dad. As we get further into the mystery surrounding this missing teenager in present-day, there are aspects and elements of the circumstances surrounding the death of my dad that come to light that are challenging to our relationship. He has taken on looking after Annie’s well-being in a bigger sense. Shawn Doyle: As the story deepens and Annie finds out more, we begin to understand the reasons why I’ve taken such care to take care of her and guide her and become almost a father figure to her. The reasons behind that become more apparent. Thetford Mines adds another character to this story. Adrienne Mitchell: It’s an interesting way to depict the dark shadow hanging over the town. It’s a town in transition, they don’t know how they’re going to survive. They are kind of fossilized like the asbestos mountains are. The woods are always moving, and they can be beautiful and fucked up at the same time. Those, visually, are two things playing off each other.